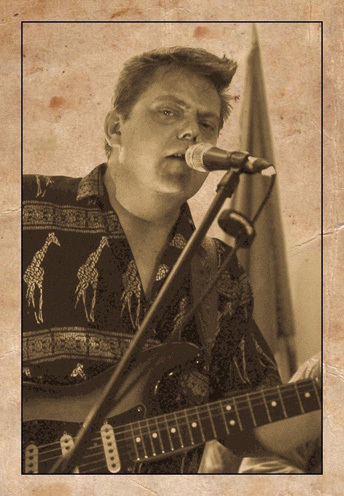 I have started working on the follow up to Heaven Bound (my solo acoustic album), which I finished touring last October with a 2 set gig at the Browsers Blues Club in Surrey. I enjoyed playing under the eaves of this quirky venue, to an appreciative and knowledgeable crowd. Sadly the club has now had to close, as the premises were scheduled for re-development into flats. This is becoming a common occurrence in London and the South East, with many pubs/venues being snapped up by developers. The writing of ‘Silent Man' is now pretty much finished. It is ready for recording. I have had two rehearsals with Dave Stein and Paul Booth, to familiarize us with the arrangements. The sessions held at Audio Underground in Stoke Newington have been a success, and some new ideas for the presentation of the tracks are emerging from that rehearsal process. Dave Stein had to head off shortly after for a week, as he had a cruise- ship- gig in the Caribbean. In the meantime I have been out enjoying a few sessions in my favourite watering holes, The Hot Hob, Round Midnight and at Aint Nothing But a Blues Bar. I recently popped in to watch the London based Niall Kelly (Niall is from across the Irish Sea) and to play with his excellent Jam Band. Guesting that afternoon was the Reading based Jason Manners, who was performing the guest spot at the Saturday afternoon acoustic session. 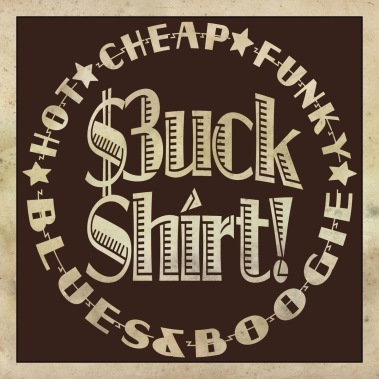 Jason Manners is the lead man of ‘3 Buck Shirt', who are a Reading -based blues outfit. They play gigs in and around Berkshire like ‘Dusty's Blues Club', and local blues festivals like the Swanage Blues. Jason was joined on stage, by Stu Young on percussion, and Neil Warren on harmonica. The set was an eclectic one, and I picked up on that when we spoke. Jason described how he sometimes likes to spice up the band set with material influenced by African music. Jason himself was born and brought up in Kenya. Intrigued, I asked Jason about his musical influences. Jason described how, when he was about ten or eleven, he had listened to an album called: ‘In memory of Robert Johnson', recorded by Paul Williams and Friends. Jason described it as featuring, “Great British blues players of the time”. On the ‘B' side of the cassette was Freddy Kings Greatest Hits, “that was my introduction, and then beyond that… like with everyone, you get a bit deeper the more you hear, you hear a song, you go back, you hear where it came from”. Jason has been playing electric guitar since he was 14, though he actually started learning the acoustic guitar when he was 9. Jason had been invited by Niall to play at Aint Nothing But. “It had always been a bit of a dream to come and play here, having jammed here in the past,” said Jason. I want to thank Jason, not only for a great set but also for talking to me about the band, especially as we had to conduct the interview outside Aint Nothing But, in the freezing cold. Jason's quiet passion for the music and his warmth was clear, I look forward to maybe jamming with him down at the Swanage Festival in March. I have been wanting, for some time to explore some of the characters on the scene that not only play the blues, but also support those of us that play with technical support. I myself have used the services of Dan Smith, who was my guitar tech on the Heaven Bound Tour. Dan set up my Martin D18 with a pick up for example, which I used at the Brighton Festival as well as the showcase I did at Arch 1, which launched the tour. I went round to speak to another of my old blues buddy's and good friend, Dave ‘Guitar' Piggott (DP). Dave and I have been friends for nearly 30 years. We played as a duo – the Baby Boomers for a long time before morphing into Dr Blue and The Prescription. 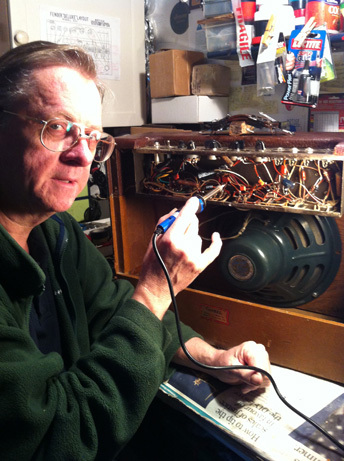 In addition to his musical talents, Dave is also an amp technician, repairing as well as building amps. (You can hear the full interview I recorded on the audio File that accompanies this chapter). DP: “Well blues players, anyway, mostly people I meet at jams or gigs, at Ain't Nothing But or the Coach and Horses, or St Harmonicas, or people on London Blues Jams, are mostly my customers”. DP: “ My father worked for the Royal Radar Establishment, when I was a kid there were always valves knocking around the house, soldering irons and all that good stuff. I remember I borrowed an enormous 200-watt Marshall PA amp, which weighed about 500 pounds, from a mate for a gig, but I blew it up, so I got my dad to repair it. We put it on the kitchen table and took the top off. It had about 8 huge coke-bottle shaped KT88 valves, and a plethora of little ones as well. I remember my dad saying as he took the top off, that he hadn't seen anything like that since before the war. I was amazed, not only did he manage to fix it, which was pretty impressive, but he also got an electric shock whilst he was doing it and jumped back. He (dad) had learnt to do this, because the trouble with high DC voltage is it makes you grip onto the cable, so he learnt to throw himself backwards when he got a shock, so I was doubly impressed. It was a rare bonding moment between us when I was a teenager. I must have stored that memory. When I started playing in bands, my amp building was restricted to building amp cabinets, PA kit was expensive to buy so I built the cabinets and put speakers in them, no actual amps per se. It was only later on when I met my good friend Mr. McKeon, and after one drunken dinner party we decided to start playing live again, that I started to buy amps and fiddle about with them. I started off doing my own repairs and doing other odd bits and pieces. I started by replacing components with better quality ones. I had one amp that I was working on, I sat down and looked at it thinking, I have replaced about 95% of the components, and thought, I could have built it. So I bought a kit of that amp and actually built one. Now I mostly build amps to meet customer needs. When I meet someone who wants an amp built, I find out what kind of amp do they want, what kind of playing they are doing, what kind of sounds they are looking for, make some suggestions to them and come up with something, and build it from there”. DP: “ Basically it was a two channel Fender 5E3 Deluxe. One of the channels is called the Normal Channel, which is what it says it is, it's a straight through channel with no fixed tone modification. The Bright Channel has a bypass capacitor on it so the high treble tone goes through the volume control, without any mitigation from the volume control. So I modified it, so the ‘Normal' channel volume control had a capacitor that rolled off the high treble to ground, so the harmonica mic didn't feed back so much, because it's the treble that causes the harmonica mic to feed back. It was a simple modification which meant you had an amp with two volume controls, one for the guitar and one for the harmonica. You could set it up and use them (the instruments) alternately and you didn't need to re-set the volume when you swapped over from guitar to harmonica. I've still got it; you can borrow it if you need to. I had lent it out to Tim Hill for 6 months whilst I was building him his custom Harp amp, but he's now got that, so the original harp amp is back with me”. DP: “ My absolute favorite amp is a 1953 5C3 Deluxe, a small tweed deluxe, that I bought off EBay from a guy in the States, he had recovered it with something that looked like sticky-backed plastic, so it looked like something Valerie Singleton had produced on an off day, which is probably one of the reasons I got it cheap. So I recovered that in proper Fender tweed, but it looked too new, it looked like it had just come out of a factory in Mexico the day before. I decided to age it with the help of some specially purchased cigarettes, some soy sauce, a couple of coats of varnish and some sanding. That's come out very nicely, and that's my favorite amp. I gig with that all the time, it has such a fabulous sound. Its then that I realized those old 1950's amps have a sound all of themselves. You can spend as much time as you like, building amps and sourcing components, its never going to sound quite the same as a 1950's amp. Its just because those old 1950's amps with their old components, the components themselves have aged and gone out of tolerance slightly, so you get a slightly different sound from building a new amp using the old designs and new components. Following on from that I bought a 1955 Gibson GA 20 that is rather sweet. I have just bought a 1953 Gibson GA40 Les Paul amp. So all of those friends of mine who know me as ‘Mr. Fender', will be amazed that I have bought a Gibson Les Paul, but it's a Les Paul amp . It's the amp that Gibson produced in 1952 to go with their brand-new ‘Les Paul' solid-body guitar. It's a fantastic thing, so that's a new project I am just starting; it's a restoration, both externally and internally. DP: “To start off you have to work out what kind of player they are, lets assume they are a Blues player. If they are going to be playing at jams, the classic small amp is the Fender Pro Junior, it's a brilliant amp, the best sounding amp in that ‘Hot Rod' range of Fender amps, that have the old tweed style cabinets. 15 watts, a 1x 10-inch speaker, tone and volume controls, all you need at a jam. If you want any fancy effects like tremolo or reverb, you can put those on with a pedal. You can get a new one for about £400 or you can buy second hand on EBay for about £250. A perfect tool, not too heavy, you can carry it on a bus if the jam is not too far from the bus stop, that's the amp to start with. Don't buy an amp with too many knobs; don't buy any amp with ‘Modeling' or effects. Just get a simple valve amp and play with that. If you are a blues player its down to your fingers, the guitar and the amp anyway, the less things between your fingers and the amp the better”.